Mule Deer (Odocoileus Hemionus) can be found throughout the entire western United States, including the deserts of the American Southwest, Mule deer have large ears that move constantly and independently, as do mules, hence the name, "Mule Deer." The Greater Yellowstone hosts a prodigious population of Mule Deer and they are a great benefit for the economy, both as photographers fodder and for hunting. Mule deer can thrive nearly anywhere; their habitats include woodland chaparral, Sonoran desert, semi-desert, shrub woodland, Great Plains grasslands, shrub land forest, sagebrush steppe, and boreal forest. Mule deer are remarkably adaptable. This stocky deer has sturdy legs and is 4 to 6-1/2 feet in length and 3 to 3-1/2 feet high at the shoulder. 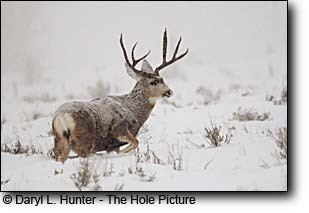 Most Mule deer are brown or gray in color with a small white rump patch and a small, black-tipped tail. Mule deer their fawns have white spots at birth. Buck deer have antlers that start growth in spring and are shed around December, these antlers are high and branch forward and reach a spread up to 4 feet in width bucks are larger than does. The life span of a mule deer in the wild is 10 years, but mule deer have lived for up to 25 years in captivity. 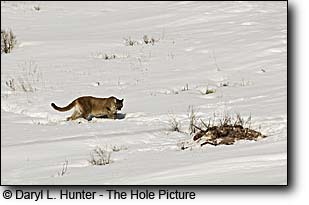 Common predators of mule deer include mountain lions, coyotes, bobcats, golden eagles, and black bears. A Mule deer’s social systems consist of herds of does related by maternal descent and bucks that mix with the does only in fall and winter. 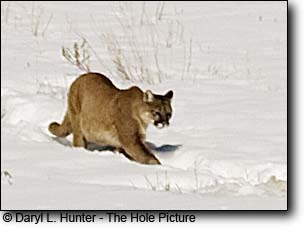 During winter and spring, dominance hierarchies maintain the stability of female herds and small male groups. If deer population densities increase, play among fawns decrease and strife and alarm behavior increases in the adults. In the spring, the wintering group breaks up, the does go off by themselves and give birth and nurse rear their fawns; Bucks wander in friendly small buddy packs throughout the summer months as their antlers grow so they can fight one another in the fall. Dominance of a buck is largely a function of his size, the larger a buck’s, antlers, the better his chances are of winning the acceptance of does and fighting off his challengers. Genetics, nutrition and age have much to do with antler size. During spring and summer antlers are grow at an awesome rate, large bucks attain growth rates of up to a quarter of an inch per day. 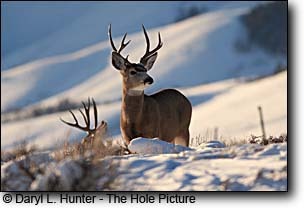 Mule deer breed in late fall at which time bucks round up females and fight for their right to keep them. Doe's begin to come into heat in November and bucks are naturally drawn to the does at this time. Many bucks are willing to fight to the death over breeding rights with a doe. After the breeding season from mid-January to about mid-April a buck sheds his antlers. A mule deer’s diet is quite varied, muleys are browsers and in spring and summer they feeds on grasses, weeds, and herbs and eat a great variety of vegetable matter, including fresh green leaves, twigs, lower branches of trees, and grasses. As are most hoofed animals (ungulates) mule deer are active in mornings, evenings and during the middle of the day mule deer bed down in a secluded and safe place. Mule deer like the cow have a multi-part stomach, the first two chambers of which act as temporary storage bins. Food stored in these storage bins can be digested later when the deer chews its cud. Mule deer have several strategies for avoiding predators, they specializes in detecting danger at a very long range by means their large ears and excellent vision. Males can quickly detect and visually track another animal as far as 600 yards away. While unable to detect motionless objects mule deer are extraordinarily sensitive to moving objects. When startled, a Mule deer will move in a series of jumps with all four feet hitting the ground together. They do not run as other deer, their distinctive bounding leap that can launch them distances of up to 20 plus feet, they can reach a speed of 45 m.p.h. for short periods doing their leaps. When necessary, they can turn or completely reverse direction in the course of a single leap. Their leap offers two advantages: it enables the deer to out-distance predators in rough terrain, and mid-leap they can see above the thick brush. 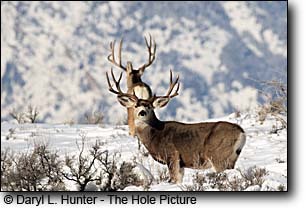 Wildlife management agencies and hunters recognize the need to maintain mule deer ranges and keep them habitable and productive so most western states have purchased critical game areas, especially winter ranges, to help maintain healthy populations of this valuable resource. 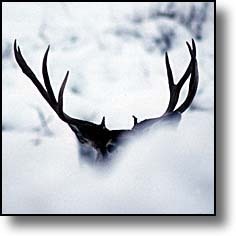 Many wind swept slopes are closed to access during the winter to protect mule deer during the trying times of winter. 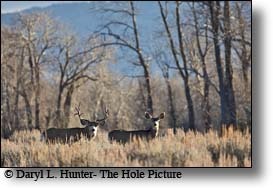 Due to a scarcity of funds and political opposition to government buying privately owned lands, the government has acquired only a small fraction of mule deer range.